The pathogenesis of syringomyelia continues to elicit controversy despite decades of research. An ideal surgical treatment for syringomyelia continues to , elude the neurosurgical fraternity. This is mainly attributable to our deficiencies in the knowledge of the pathogenesis of syringomyelia. The case presented here provides an opportunity to retest some of the hypotheses of syringomyelia. A 33 years old female noted abnormal sensations in her left upper limb of two months duration. She was evaluated by neurologists and was believed to have psychiatric illness. She was then referred to a psychiatrist and was treated for somatoform disorder for two years when she complained of worsening of sensory disturbances in the form of sensory loss in a "cape-like" distribution along with painless ulcers in the left hand. At this time, the imaging of the cervical spine was done and she was found to have chiari I malformation and syringomyelia. She was later referred to neurosurgery for further management. On admission to neurosurgery department, she had normal optic fundi, sensory impairment from C4 to T8 on the left side with small, trophic ulcers in the left hand. Her left hand grip was weak. MRI examination revealed panventricular hydrocephalus with chiari I malformation along with syringomyelia extending from C1 to lower thoracic region. There was evidence of communication of fourth ventricle with the syrinx [Figure 1]a and b. The patient underwent a right ventriculoperitoneal shunt. Following shunt insertion, there was no change in the patient's neurological status. CT scan showed decompression of the supratentorial ventricles with persistent dilatation of the fourth ventricle [Figure 1]c and hence, the patient underwent foramen magnum decompression and intradural exploration. An upper cervical laminectomy was also done for a possible syringopleural shunt, if necessary. During intradural exploration, an arachnoid veil was found to be covering the foramen of Magendie. The arachnoid veil was opened which revealed a gush of CSF. Following this the cervical cord size was found to decrease intraopertively and hence the planned syringopleural shunt was not done. Following foramen magnum decompression, the patient's neurological status improved with significant improvement in sensations and healing of trophic ulcers. Two months after surgery, she went back to work as a school teacher. Follow up MRI revealed collapse of the syrinx and decompression of ventricular system. However, interestingly, a thin streak of CSF representing the central canal was found extending from upper cervical to lower thoracic regions [Figure 2] and [Figure 3]. This was found to be consistent with the MRI appearance of the central canal as described by Holly and Batzdorf  and Petit-Lacour et al. Five months later, she presented with a one week history of difficulty in walking and diminished sensations over the left upper limb and left side of the trunk. There was no history of headache, vomiting or transient obscurations of vision suggestive of shunt dysfunction. Examination at this time revealed normal optic fundi, diminished sensations from C2 to T8 on the left side, Grade 4/5 power in lower limbs, exaggerated knee and ankle jerks and bilateral upgoing plantars. Her shunt was found to be nonfunctional. MRI at this time revealed pan ventricular hydrocephalus with the fourth ventricle communicating with the holocord syrinx [Figure 4]a and b. Patient underwent a revision of the ventriculoperitoneal shunt with gradual resolution of symptoms. Oi and colleagues introduced the term "hydromyelic hydrocephalus" on the basis of their experience with nine cases of hydromyelia associated with hydrocephalus. 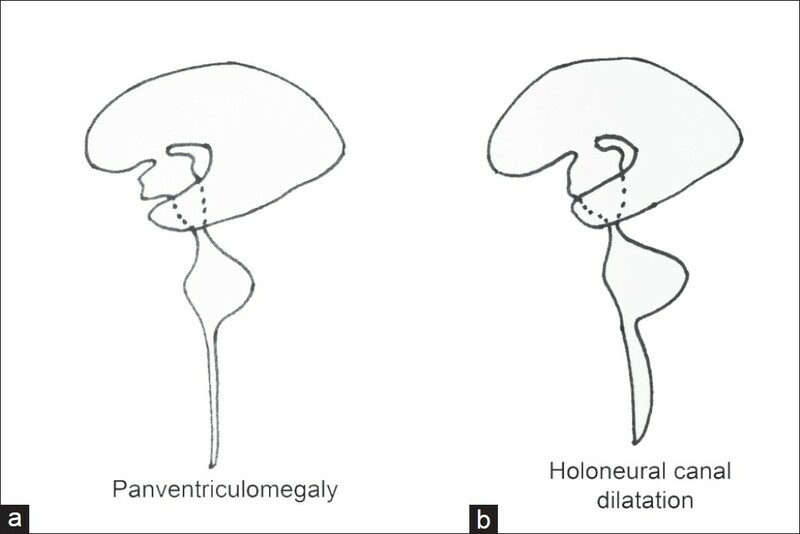 They noted four stages in the evolution of hydromyelia associated with hydrocephalus: Stage I: dilatation of lateral ventricles, Stage II: dilatation of lateral and third ventricles, Stage III: dilatation of lateral and third ventricles with disproportionate dilatation of fourth ventricle, and Stage IV: dilatation of all the ventricles with communication of the fourth ventricle with the dilated central canal. Oi and colleagues called stage IV as Holoneural canal dilatation. Our case conforms to Oi's Stage IV or holoneural canal dilatation. Oi and colleagues also showed that isolated CSF compartments can develop after shunting in such patients. They showed that four different types of isolated CSF compartments can occur after shunting due to functional obstruction: Type I: when there is functional obstruction of the foramen of Monro there is progressive unilateral dilatation of one lateral ventricle; Type II: when there is aqueduct stenosis along with obstruction of the fourth ventricular outlets there is isolated fourth ventricle; Type III: dilatation of the fourth ventricle which communicates with the central canal of the spinal cord and this was termed as "isolated rhombencephalic ventricle"and, Type IV: where there is isolated dilatation of the central canal of the spinal cord. The pathogenesis of syringomyelia in our case can be summarized as follows: Stage I: the disease process started with panventricular dilatation [Figure 6]a; Stage II: persistence of this panventricular dilatation led to the development of communication between the dilated fourth ventricle and the central canal (holoneural canal dilatation) [Figure 6]b; Stage III: decompression of the supratentorial ventricles by shunting the lateral ventricle led to the formation of isolated rhombencephalic ventricle as suggested by Oi and colleagues  as manifested by the fact the patient's symptoms of syringomyelia did not improve even after shunting the lateral ventricles [Figure 7]; Stage IV: formen magnum decompression with excision of the arachnoid veil led to the decompression of the isolated rhombencephalic ventricle and the patient's symptoms improved; Stage V: when the patient presented with shunt dysfunction, she reverted back to stage II with panventricular dilatation and holocord syringomyelia (i.e., holoneural canal dilatation). 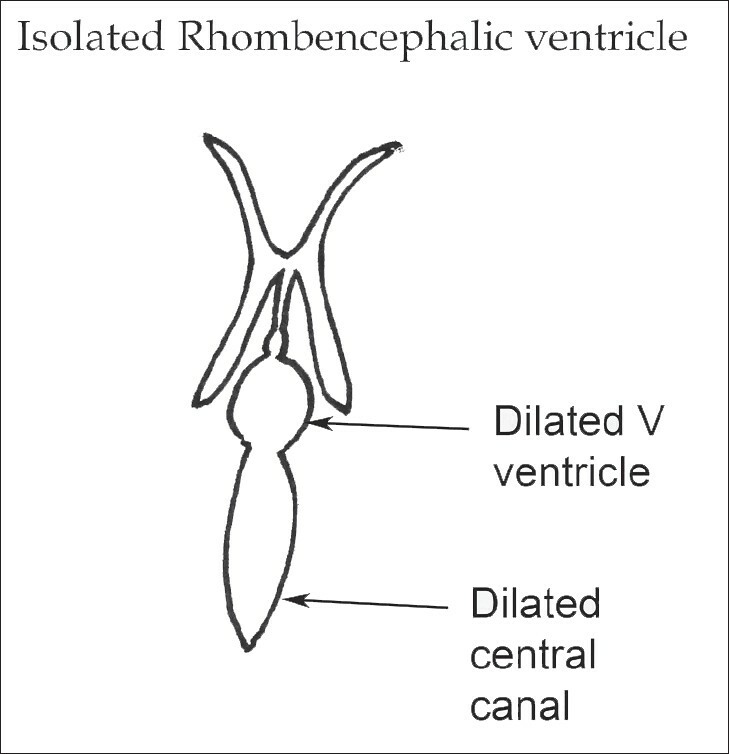 Figure 6: Schematic representation of the "isolated rhombencephalic ventricle" as described by Oi et al. 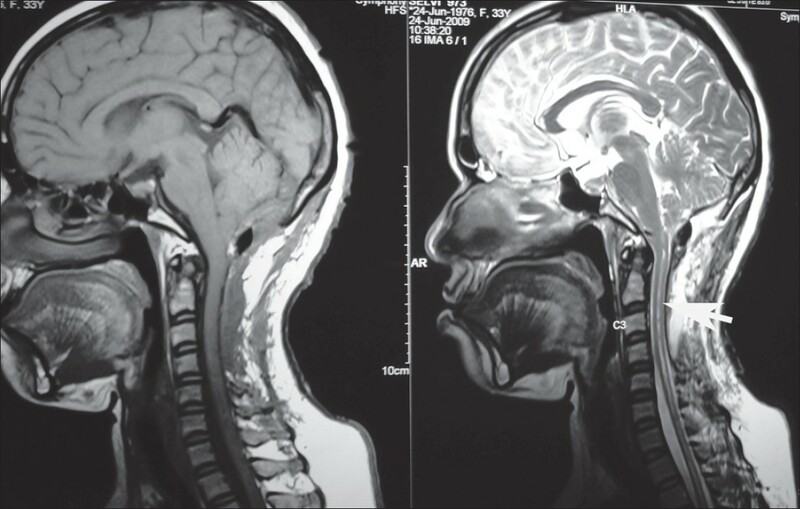 Ogilvy and Borges reported the rapid improvement in the symptomatology of communicating syringomyelia with associated hydrocephalus in a 58 year old man with a long history of symptoms. In a previous report, Milhorat and colleagues have shown that a patient with hydrocephalus, chiari I malformation and syringomyelia who had been treated with ventriculoperitoneal shunt and foramen magnum decompression one of the presentations of shunt dysfunction is rapid occurrence of syringomyelia. Milhorat and colleagues equated the dilated central canal in this condition to a "fifth ventricle". Peraud and Grau recently reported a 33 year old female who presented with postmeningitic hydrocephalus with communicating syringomyelia which rapidly improved following surgical intervention. It has been previously shown that when a patient with arrested hydrocephalus decompensates, development of a presyrinx state might be one of the ways of decompensation and treatment of the decompensated arrested hydrocephalus can reverse the presyrinx state. 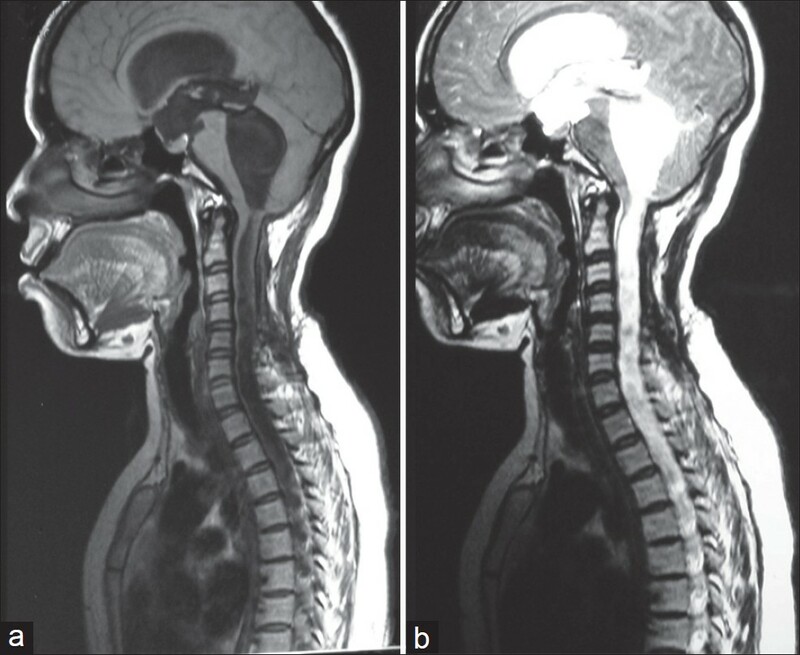 More recently, Camacho and colleagues have documented the development of communicating syringomyelia in a preterm infant with post hemorrhagic hydrocephalus. 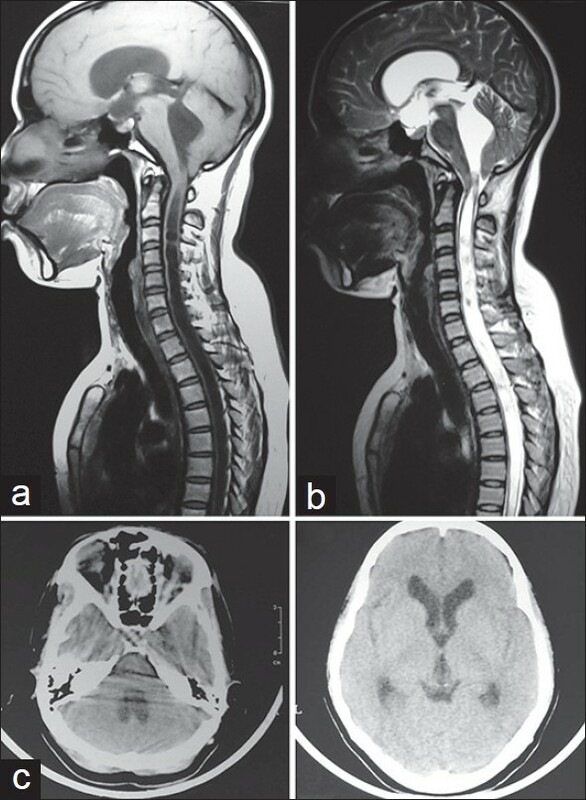 More recently, Hagihara and Sakata reported a 13 year old boy with disproportionately large communicating fourth ventricle with syringomyelia in whom there was complete clinical and radiological improvement following placement of ventriculoperitoneal shunt. The case reports by Peraud et al., Muthukumar et al., Camacho et al., and Hagihara et al. ,,, have shown even in the absence of Chiari malformation More Details communicating syringomyelia can develop rapidly and this syrinx responds well to CSF diversion. These case reports lend credence to the existence of the "potential" for communication between the fourth ventricle and the "potentially patent" central canal of the spinal cord (to be discussed below). If this is so, why then communicating syringomyelia does not develop in the commonly encountered condition of obstructive hydrocephalus in infants? This is because of the following reasons: 1. Many cases of obstructive hydrocephalus are due to aqueduct stenosis and hence the fourth ventricle is not dilated and, therefore, communicating syringomyelia does not develop 2. In those infants with obstructive hydrocephalus due to fourth ventricular outlet obstruction, the open fontanelles and unfused sutures act as an "exhaust valve" with resultant increase in head circumference and thereby prevent the development of communicating syringomyelia. The reasons for the infrequent development of communicating syringomyelia in adults will be discussed below. The pathophysiology of syringomyelia is multifactorial. Explanations for the development and maintenance of syringomyelia might vary from case to case and it might not be possible or even necessary to have a single hypothesis to explain the pathogenesis of all forms of syringomyelia. In cases where there is radiological evidence of patent communication between the syrinx and the "dilated" fourth ventricle, the development and maintenance of syringomyelia is by the flow of CSF from the ventricles into the central canal. Absence of improvement following ventricular shunting procedures does not militate against the existence of this "communicating" syringomyelia as this can be explained the the ventriculosyringeal valve effect of Hall [Figure 7] and the isolated rhombencephalic ventricle of Oi. Patients with hydrocephalus and communicating syringomyelia when they deteriorate after treatment, shunt dysfunction might be heralded by the reappearance of syringomyelic symptoms without the presence of signs and symptoms of increased intracranial pressure as the development of syringomyelia in this condition is due to decompression of the ventricles into the central canal of the spinal cord. In such cases, the central canal of the spinal cord acts as an "exhaust valve" for the dilated ventricular system. Clinicians should be aware that shunt dysfunction might present with symptoms of syringomyelia in such patients without overt clinical signs of increased intracranial pressure. Postoperative scans after foramen magnum decompression in our patient [Figure 2] showed the collapsed but persistent central canal. This highlights the fact that at least in some patients with communicating syringomyelia, once syringomyelia develops, the normal age-related obliteration of the central canal as suggested by Cornill and Mossinger, Kasantikul et al., Netsky et al., Milhorat and colleagues, Yasui and colleagues ,,, does not happen and hence these patients are at a greater risk of syrinx recurrence. This is further reiterated by the case report of Milhorat et al. 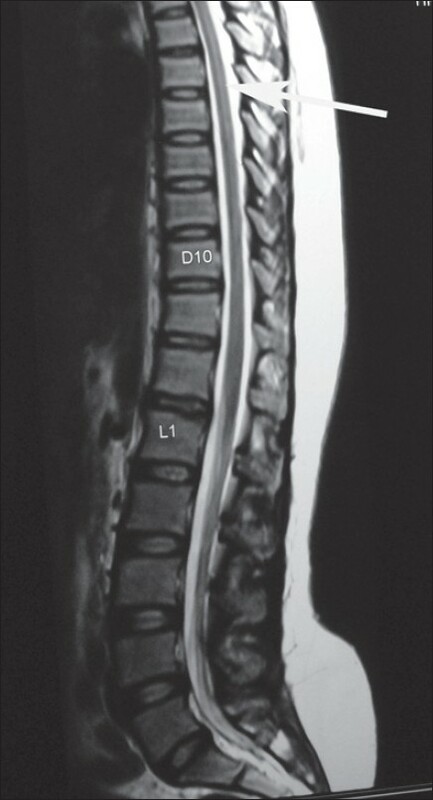 where the syringomyelia reappeared eight years later during an episode of shunt dysfunction thereby showing that in such patients true age-related obliteration of the spinal canal does not happen even several years after treatment. The autopsy study by Milhorat and colleagues is often widely quoted to substantiate the age dependent stenosis of the central canal. However, a detailed analysis of Milhorat's study reveals many interesting facts. Milhorat et al. classified stenosis of the central canal as follows: Grade 0: No stenosis, Grade I: 1-25% reduction, Grade 2: 25% to 50% reduction, Grade 3: 50% to 75% reduction, Grade 4: 75% to 99% reduction, and Grade 5: 100% reduction. In their study, Grade 5 occlusion of the entire canal was present only in four of the 232 cases and these individuals were 43, 59, 60 and 73 years of age respectively. This means that in the majority of individuals, even though, the central canal becomes stenosed it does not become totally occluded and thereby remains functionally patent. In the very same study, five adults older than 20 years had completely patent canals and 18 others had patent canals except for partial stenosis (Grade 1 to 3) at one or two levels. They also mentioned that even in individuals who had stenosis there was relative sparing of the rostral and caudal ends of the canal. A recent clinical study by Holly and Batzdorf has shown that in normal individuals, the central canal of the spinal cord can be visualized by MRI. In their study, in the majority of the individuals, the appearance of the central canal remained static during follow up. Suprisingly, in accordance with the autopsy study of Yasui et al., the highest incidence of persistent central canal was found in the cervical region. The mean patient age in their study was 40 which once again correlates with the autopsy study of Yasui et al. An MRI study by Petit-Lacour and colleagues showed that with 1.5 Tesla MRI imaging it is possible to visualize the central canal in 1.5% of normal individuals of whom 83% were females with a mean age of 34 years. With the increasing availability of 3.0 Tesla MRI, the incidence of this finding is likely to increase. These studies further lend credence to the hypothesis that the central canal can remain patent in a proportion of individuals, most often in the cervical region, and thus may participate in the pathogenesis of syringomyelia. 1. Goel A. Is syringomyelia pathology or a natural protective phenomenon? J Postgrad Med. 2001 Apr-Jun;47:87-8. 3. Holly LT, Batzdorf U. Slit-like syrinx cavities. Persistent central canal. J Neurosurg 2002;97:161-5. 4. Petit-Lacour MC, Lasjaunias P, Iffenecker C, Benoudiba F, Hadj Rabia M, Hurth M, et al. Visibility of the central canal on MRI. Neuroradiology 2000;42:756-61. 5. Hall P, Turner M, Aichenger S, Bendick P, Campbell R. Experiemtal syringomyelia. 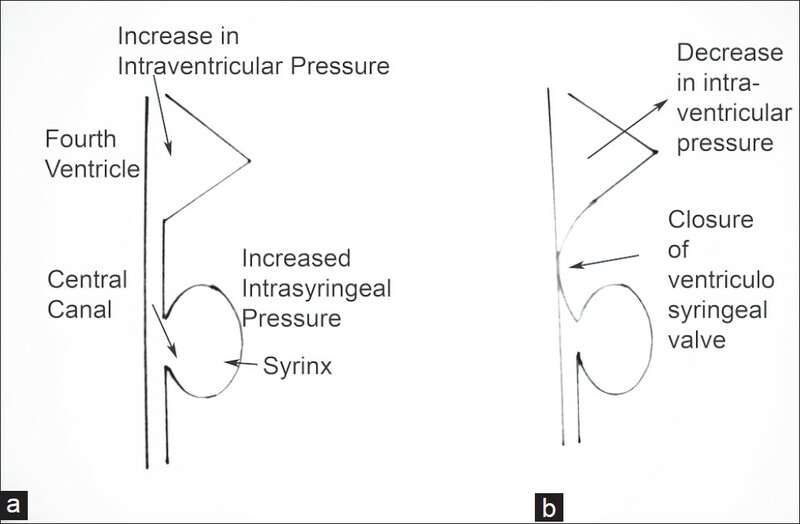 The relationship between intraventricular and intrasyrinx pressures. J Neurosurg 1980;52:812-7. 6. Becker DP, Wilson JA, Watson GW. The spinal cord central canal: Response to experimental hydrocephalus and canal occlusion. J Neurosurg 1972;36:416-24. 7. Dohrmann GJ. Cervical spinal cord in experimental hydrocephalus. J Neurosurg 1972;37:538-42. 8. Eisenberg HM, McLennan JE, Welch K. Ventricular perfusion in cats with kaolin-induced hydrocephalus. J Neurosurg 1974;41:20-8. 9. Hall PV, Muller J, Campbell RL. Experimental hydrosyringomyelia, ischemic myelopathy, and syringomyelia. J Neurosurg 1975;43:464-70. 10. Hall PV, Campbell RL, Kalsbeck JE. Meningomyelocele and progressive hydromyelia. Progressive paraparesis in myelodysplasia. J Neurosurg 1975;43:457-63. 11. Hall PV, Kalsbeck JE, Wellman HN, Batnitzky S, Campbell RL, Lewis S. Clinical radioisotope investigations in hydromyelia and myelodysplasia. J Neusourg 1976;45:188-94. 12. Hall PV, Kalsbeck JE, Wellman HN, Campbell RL, Lewis S. Radioisotope evaluation of experimental syringomyelia. J Neusourg 1976;45:181-7. 13. Hall P, Lindseth R, Campbell R, Kalsbeck JE, Deousa A. Scoliosis and hydrocephalus in myelocele patients. The effects of ventricular shunting. J Neurosurg 1979;50:174-8. 14. Oi S, Kudo H, Yamada H, Kim S, Hamano S, Urui S, et al. Hydromyelic hydrocephalus. Correlation of hydromyelia with various stages of hydrocephalus in postshunt isolated compartments. J Neurosurg 1991;74:371-9. 15. Ogilvy CS, Borges LF. Treatment of symptomatic syringomyelia with a ventriculoperitoneal shunt. A case report with magnetic resonance scan correlation. Neurosurgery 1988;22:748-50. 16. Milhorat TM, Bologenese PA, Black KS, Woldenberg RF. Acute syringomyelia. Case report. Neurosurgery 2003;53:1220-1. 17. Peraud A, Grau S. Decompensated hydrocephalus causing syringomyelia and tetraparesis. Case report. Childs Nerv Syst 2009;25:263-6. 18. Muthukumar N, Venkatesh G, Thiruppathy S. Arrested hydrocephalus and presyrinx state. J Neurosurg 2005;103:466-70. 19. Camacho A, Simon R, Munoz A, Hinojosa J, Orbea C. Syringomyelia secondary to posthemorrhagic hydrocephalus in a preterm infant. Pediatr Neurol 2008;38:211-4. 20. Hagihara N, Sakata S. Disproportionately large communicating fourth ventricle with syringomyelia- case report. Neurol Med Chir (Tokyo) 2007;47:278-81. 22. Kasantikul V, Netsky MG, James AE Jr. Relation of age and cerebral ventricle size to central canal in man. Morphological analysis. J Neurosurg 1979;51:85-93. 23. Netsyky MG. Syringomyelia. A clinicopathologic study. AMA Arch Neurol Psychiatry 1953;70:741-77. 24. Milhorat TM, Kotzen RM, Anzil AP. Stenosis of central canal of spinal cord in man. Incidence and pathological findings in 232 autopsy cases. J Neurosurg 1994;80:716-22. 25. Yasui K, Hashizume Y, Yoshida M, Kameyama T, Sobeu G. Age-related morphologic changes of the central canal of the human spinal cord. Acta Neuropathol 1999;97:253-9. 26. Newman PK, Terenty TR, Foster JB. Some observations on the pathogenesis of syringomyelia. J Neurol Neurosurg Psychiatry 1981;44:964-9. 27. Oldfield EH, Muraszko K, Shawker TH, Patronas NJ. Pathophysiology of syringomyelia associated with chiari I malformation of the cerebellar tonsils. Implications for diagnosis and treatment. J Neurosurg 1994;80:3-15. 28. Oldfield EH. In Neurosurgical Forum. J Neurosurg. www.scientificexploration.org/journal.html. 1994;81:501-2. 29. Gernert D. Occam′s razor and its improper use. J Scientific Exploration 2007;21:135-40.